The PTO will hold month-long CLOTHING DRIVE during November. This clothing drive is intended to provide extra clean clothing to the school for use by students on those days when "accidents" happen. 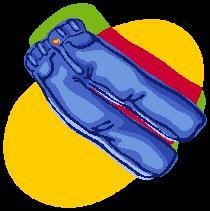 We are requesting new or very gently used clothing items such as sweatpants, underwear, and socks. We suggest sending clothing sizes that your own children might wear in a variety of colors. A barrel will be provided by the front office to drop donations inside.